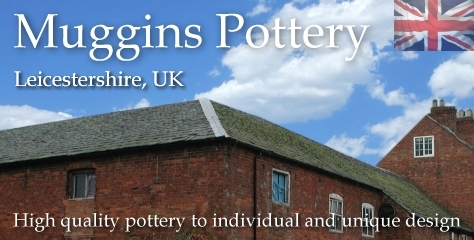 Pottery Mugs | hand-made pottery from Muggins Pottery in Leicestershire - wedding gifts, birthday presents, christening presents and anniversary gifts. The Classic Muggins Face Mug. Each is unique - this one smiles at you. Fully vitrified and suitable for use with you favourite ale or simply stand him on a shelf. Roughly a half pint capacity. The Classic Muggins Face Mug. Each is unique - this one is in a BAD mood. Fully vitrified and suitable for use with you favourite ale or simply stand him on a shelf. Roughly a half pint capacity. The Classic Muggins Face Mug. Each is unique - this one has a hangover. Fully vitrified and suitable for use with you favourite ale or simply stand him on a shelf. Roughly a half pint capacity. The Classic Muggins Face Mug. Each is unique - this one has a smoking habit. Fully vitrified and suitable for use with you favourite ale or simply stand him on a shelf. Roughly a half pint capacity. The Classic Muggins Face Mug. Each is unique - this one is slightly drunk. Fully vitrified. Roughly a half pint capacity but drinking from it could be a challenge. A pair of slumped Muggins Face Mugs. Slightly drunk - more ornamental than functional - but quite capable of holding their ale. They are shaped to loosely fit together. Use with you favourite tipple (something of a challenge) or simply stand them on a shelf. Measurements are as a pair. Both have roughly a half pint capacity. For a cold winter night. Keep Jack Frost from nibbling at your toes. Capacity roughly half a UK pint, so ideal to hold a glass of warm mulled wine. Tiny versions of the Muggins Face Mug. Sold in pairs - price is for two. Made with handles but can be made without if you wish. One-off individual mugs can be made if you wish. The Classic Muggins Face Mug. Each is unique - this one smiles at you. Fully vitrified and suitable for use with you favourite ale or simply stand him on a shelf. Roughly a pint capacity. The Classic Muggins Face Mug. Each is unique - this one has a smoking habit. Fully vitrified and suitable for use with you favourite ale or simply stand him on a shelf. Roughly a pint capacity. The Classic Muggins Face Mug. Each is unique - this one is slightly drunk. Fully vitrified. Roughly a pint capacity but drinking from it could be a challenge. Just to let you know that I have received my order and they are lovely! I wanted to thank you once again for helping me out and getting them to me so fast, my brother will be so pleased! I promise I will be back again soon and Im telling everyone about you so hopefully send some more business your way.